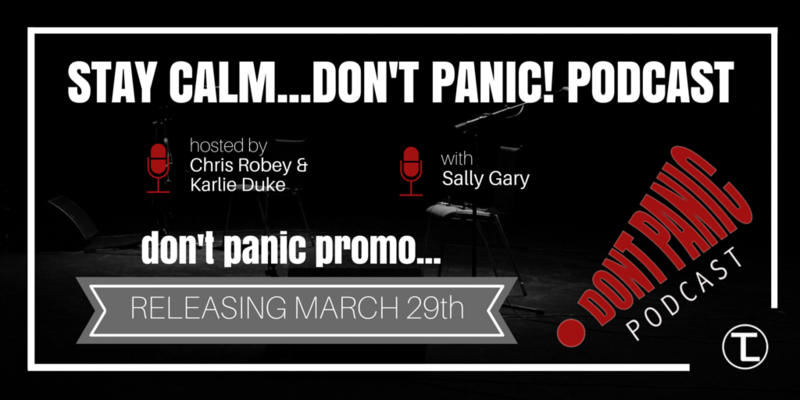 We are excited to announce a brand new podcast called Stay Calm…Don’t Panic! with Chris Robey and Karlie Duke coming March 29th! This podcast deals with real issues that real teenagers face in order to equip those who help and interact with these adolescents. Join us to learn more about how you as a parent, youth minister, school counselor, social worker, mentor, volunteer, or coach can help walk teenagers through issues with social media, self-harm, homosexuality, grief and much more! This sneak peek includes a clip from our discussion with Sally Gary. Sally is Executive Director of Center Peace where she works to encourage churches, schools and families to have conversations about homosexuality. She is also a speaker and author of Loves God, Likes Girls: A Memoir. Check out this clip about Sally’s conversation with a teenage boy, his questions about homosexuality, and the need to provide community and connection. We believe these episodes and the interviews with experts will be extremely valuable to you. The first 3 episodes of season 1 will release on March 29th. To make sure that you are ready for the Don’t Panic! Podcast, go ahead and subscribe on iTunes or wherever you like to listen to your podcasts. You can also visit the Don’t Panic! Podcast website to find us on social media and learn how you could win a $50 Amazon gift card! All I Want For Christmas Is…Groups!